The ingredients used in the poultry feed formulation are typically selected based on a number of factors such as the nutritional content, the palatability of the ingredients, the absence in the poultry feed of non-nutritional factors, absence of non-toxic factors in the poultry feeds as well as on the cost of sourcing the ingredients. The main nutrients that should be in the poultry feed include amino acids which are found in the proteins, the minerals as well as the vitamins. Poultry feed should also contain ingredients that contain lots of energy. Every life function requires the energy that is derived from the starches, proteins and lipids. The cereal grains used in the poultry feed will help meet the energy requirements of the chicken. They fall into several categories such as cereal grains, cereal by-products as well as distillers dray grains which contain solubles. The most used cereal in poultry feed is corn or maize. However, different countries use a variety of cereals. While maize is the dominant cereal used in countries such as the US, Brazil, Africa and Asia, in some places such as Russia, Australia, Europe, Canada and NZ, wheat is predominant cereal used in the poultry feeds. Due to the principle of least cost formulation, millers will use the grains that is most readily available at the most reasonable pricing and that is reflected in the differences in the grains used in the various countries. 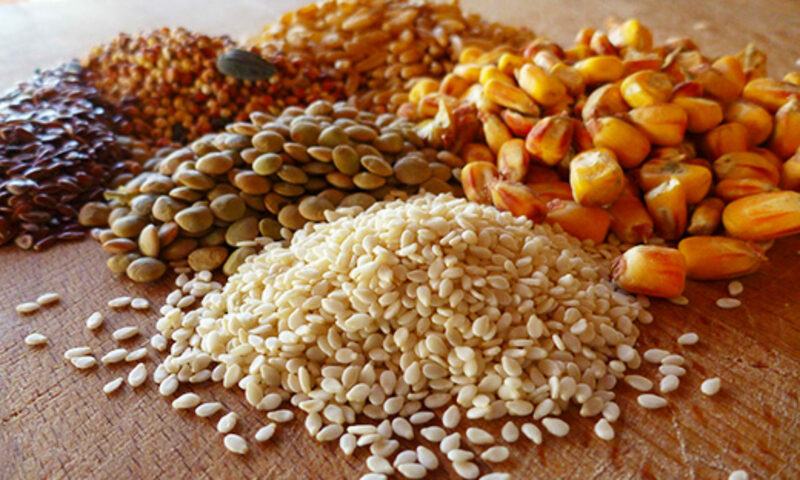 Even within some countries such as US and China, there is a difference in the dominant grains used in formulating the poultry feeds. Other cereals used in the poultry feeds based on price and availability include barley, sorghum and rye. While you could use any of these cereals to substitute each other depending on their availability and price, you must take extra care when substituting one grain component to another. A sudden change in the components or ingredients used in the poultry feeds can lead to digestive upsets and eventually have a negative impact on the productivity of your poultry. The quality of the cereal grains used in the poultry feed will also vary based on a number of factors such as the storage condition of the grains and the seasonal conditions. If the grains have been grown in poorer conditions, they are likely to have a lower energy content and might also be contaminated by the mycotoxins as well as fungi and ergots both of which produce toxins. There are environmental and genetic factors that can also adversely affect the quality of the grain. These will have a negative impact on the content of the nutrients in the grains as well as the nutritive value of the poultry feeds. Cereal by-products may also be used in the poultry feeds. These include the wheat bran, rice bran and distillers dry grains with solubles. Poultry feeds proteins come from both animal and plant sources. Typical plant sources of proteins include legumes and oilseed. Sources of animal proteins include fish processing by-products or fishmeal and abattoir products. There are numerous vegetable protein sources that you can work with in poultry feed formulation. The main sources are the by-products of the oilseed crops which come in the form of cakes or a meal. Typical oilseed crops are copra, soybean, sesame seeds, linseed peanuts, palm kernel, rapeseed or canola and sunflower. Once the oil has been extracted from the oilseeds, the residue left is used as feed ingredients. Oilseed residues make up anywhere from 20% to 30% of the poultry diet. The proportion used varies depending on the type of poultry the feed is being formulated for and even regions. Other sources of vegetable protein sources that are used in poultry feeds include cottonseeds, sunflower, lupins and peas. These may be included in the poultry feed formulations if they can be sourced at reasonable pricing. However, a lot of the oilseeds used in poultry feed formulations have various anti-nutritive factors. Some of these are generally destroyed by heat. There are newer cultivars used in poultry feed formulations which are however low in the anti nutritive factors and can thus be used in poultry feeds without adverse effects. The animal protein sources that are used in poultry feed formulation include bone meal, fish meal, meat meal, blood meal, feather meal and poultry by-products meal. The use of animal meal in poultry industry has continued to grow in leaps and bounds over the years even though it has been mired in much controversy. The animal protein industry has emerged out of the need to add extra value in the ingredients used in making the poultry feeds. They generally have a higher nutrient content and different flavour to the plant protein sources so they add variety to the poultry feeds. It is estimated that up to 50% of the live weight of the ruminants and an 30% of the live market weight of poultry constitutes by-products. These are subsequently rendered and milled to be used as poultry food source. In the poultry industry, the animal protein ingredients include bone meal, fishmeal, feather meal and blood meal among others. There are some limitations, however, on the use of animal poultry ingredients in poultry feeds. It is required, for example, that they meet the minimum quality and nutrient levels. The meat and bone meal to be used in poultry feed formulation should, for example, be free of wool, hair and hide trimmings. The animal by-products are generally rendered before being used in the poultry feeds. This is a bio-process where water is evaporated and the fats are extracted. The resulting ground finished product will have lots of protein and minerals such as calcium and phosphorous. The use of animal by-products in poultry feed formulation is not without challenges, however. The most important concern is the safety of the raw products. A lot of people have lots of concerns about the recycling of animal proteins back into the poultry food chain and some feel it could be a pathway through which some diseases such as the mad cow disease enter the human system. Apart from the food safety concerns, there are also ethical concerns. A lot of people feel it is wrong to feed meat, especially poultry meat, to chicken. Poultry feed formulation can be regarded both as an art as well as a science. For successful and accurate poultry feed formulation, you need good knowledge of the poultry feed ingredients, a little bit of innovation as well as patience. A good poultry feed formulation should include information on the amount of each of the ingredients that should be added to the poultry diet. There should also be information on the concentration of the various ingredients used in the poultry feed formulations. The composition of the nutrients used in the poultry feed formulation will show whether the poultry feed is adequate for the class of chicken it is to be used on. Layers require a certain nutrient composition and the case is the same with broilers. The formulation of chicks will be different from that of growers or birds that are at the point of lay. A lot of the poultry feed formulations will also show the amount of energy in the poultry feeds. This is shown here in terms of the metabolisable energy. Formulated poultry feeds will also show the amount of proteins used in the poultry feed as well as complete information on the minerals and the digestible amino acids used in the poultry diet. Typical digestible amino acids used in the poultry feed formulations will include methionine, a limiting amino acid as well as various essential amino acids. There are a host of poultry feed formulation databases available that contain information on the various digestible amino acid contents in the various poultry feed ingredients that you can use in your poultry feed formulations. Poultry feed formulation is also called least cost formulation because you have to mix the right ingredients with the nutrient requirements in the most economical manner. To do this successfully, you need to have an in depth grasp of a number of factors such as the nutrient requirements of a certain class of poultry, the nutrient components of the ingredients used in the poultry feeds, prices of the ingredients as well as the digestibility values of the ingredients you are using to formulate the poultry feeds. Using this knowledge, you can apply a feeds formulation mathematical formula in order to derive the various ingredients that need to be included in the poultry feeds. This information also includes the proportion in which these ingredients need to be added the poultry feed. Of course in a large mill, the whole process is computerised and might not be challenging like in the case of someone trying to mix the feeds in their backyards. The formula for mixing the ingredients is generally simpler if you are only using a few ingredients. But if you using a lot of ingredients, it gets a lot more complex. You can also purchase the various feed formulation packages that are available in the market currently for the various classes of poultry. Large feed mills may have the resources to produce more precise poultry feeds. For example, they can create small amounts of test diets that can be tested in laboratories to ensure it meets the right quality standards before it is produced en masse. The tests generally determine if the poultry feed has the right chemical composition required for the class of poultry that it will be used on. But with the right knowledge of poultry feed formulation, you can still mill poultry feeds in your backyard without constructing mammoth poultry feed mills.